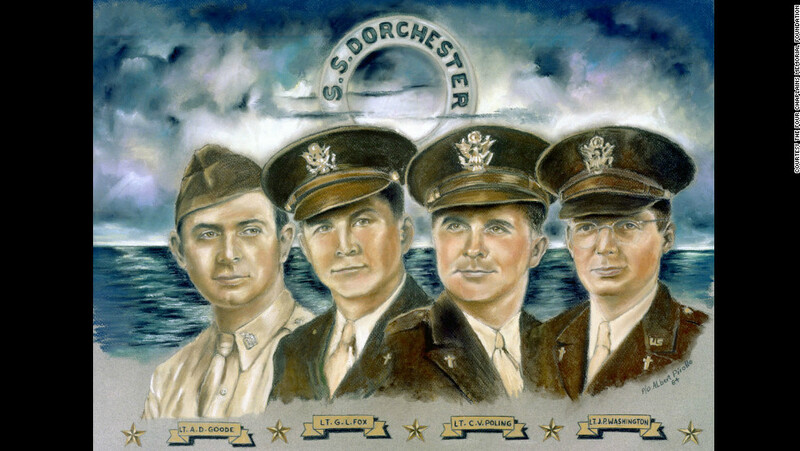 On February 3, 1943 a torpedo struck the S.S. Dorchester. Chaos reigned on board as the boat filled with water. Men rushed aroundin a panic. Many had run up from the hold without life jackets. Overcrowded lifeboats capsized; rafts drifted away before anyone could reach them. Survivors testified that there seemed only one little island of order in all the confusion – the spot where four chaplains stood, on the steeply sloping starboard side. Alexander David Goode, a rabbi, George Lansing Fox, a pastor, Clark Poling, a minister, and John Washington, a priest, calmly guided men to their boat stations. They distributed life jackets from a storage locker and then helped men frozen with fear over the side. Hundreds of men were crying, pleading, praying, and swearing. But through it all, the chaplains spoke words of courage and confidence. “Their voices were the only thing that kept me going,” one survivor recalled. When the supply of life jackets was gone, the four chaplains gave away their own. As the water flooded the deck the chaplains remained standing firm, arms linked; their voices could be heard across the waters praying in Hebrew, Latin, and English. God will give you the power to stand firm in the face of the storms of life. He will give you His peace as you trust in Him.